Light filled, architect designed cottage, beautiful views, sleeps 3. Two architect designed one-bedroom cottages. Built to the same design and standard the cottages are separate and private and surrounded by 10 acres of mountain-top gardens and forest. The view from each cottage is magnificent. Highest standard of accommodation compliment the beautiful natural surrounds. Spacious and separate living, bedroom and kitchen areas with a large deck on two sides overlooking beautiful gardens and forest with views to Melbourne. Cosy wood fire, reverse cycle air conditioning, spa bath and full kitchen make the cottage suitable for weekend or week long stays. Quiet, privacy and peacefulness surrounded by native forest, birds and animals in the heart of the Yarra Valley. Go down into the valley and picture vineyards, a river, sophisticated wining and dining and friendly shopkeepers with time for a chat. Frame all this with a dramatic range of mountains covered in native forest only an hour from Melbourne. Come and find us in Melbourne's beautiful Yarra Valley. Included in all stays of two days or more are provisions for two people for the first morning so you can cook a full country breakfast at your leisure. Provisions for a continental breakfast are provided for the second morning. Quality bathrobes, towels and linen are also supplied. Tessa and I met grape picking in Mildura. Tessa had spent a year in China in 1980 after graduating in Chinese from Durham university in England. She was still traveling when we met in 1985. Originally from Scotland I grew up in Wollongong and was about to backpack around Canada. Having just met we set off together and spent several months in Alaska and continued travelling the world for the next three years. On our return we lived in Melbourne for five years, which we loved but always felt a pull to the countryside. We have lived in the beautiful Yarra Valley for 20 years, the best of both worlds, with Melbourne and all it has to offer at our doorstep and everyday surrounded by the beauty of nature. Tessa and I have built two cottages on 10 acres surrounded by natural forest with views to Melbourne and the bay. It is so peaceful. Wallabies and wombats live in and around the garden and the songs of Lyrebirds fill the air, particularly in the winter. We are still in love with the property 20 years later and are often reminded by our guests just how beautiful nature is. Lyrebird Cottages is a 10 acre property with two cottages. The cottages are architect designed and built to the same design and standard. Each cottage has a great view and is set in lovely gardens and surrounded by natural forest. They are both very peaceful and private. The cottages are filled with natural light and deigned with interior mudbrick walls and beautiful old Australian hardwood timber. They have wood fires and electric heating, a double spa and shower and a full kitchen with plenty of space. Music, books, drawing materials as well as DVD's and television are some of the things to enjoy when you aren't on the large outdoor deck bird watching or walking through the Lyrebird track through the 7 acres of forest on our property. Massage is available in the cottage or just 5 minutes away is a day spa set in a delightful rainforest setting. The nearest vineyard is 10 minutes from us and the Healesville sanctuary and Healesville shops are 15 minutes away. We can provide meals for dinner in your cottage so you can enjoy a sunset on the deck and a bottle of wine without going anywhere. The valley has many good walks. There is a 2 hour circuit starting at the cottages. It meanders through the forest before returning along the scenic and quiet Nyora road. Lyrebird Cottages is a paradise for birdwatching and for chilling out in nature. 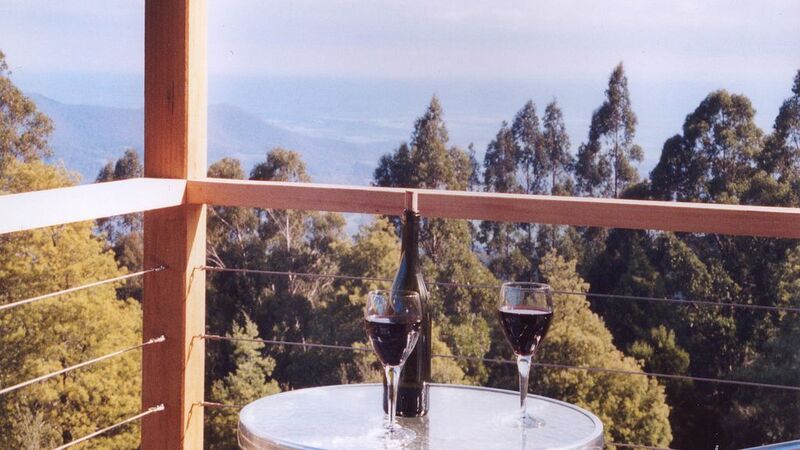 With a big view is to Melbourne 50 km's away Lyrebird Cottages is 10 minutes from Healesville Sanctuary and 10 minutes to the nearest vineyard cellar door. Healesville shops are 15 minutes. Reverse cycle air-conditioning is provided in addition to a radiant wood fire. Electric heating and reverse cycle air-conditioning in addition to the wood burning stove. A full laundry is available on request. Parking is next to the cottage in the cottage car parking. There is a separate driveway entrance to the cottage car park. A quality towel set is provided. Wood is supplied for the cast iron radiant wood fire. Spacious and light filled living room with views across the Yarra Valley to Melbourne's skyline in the distance. A library of quality books is available to read and to purchase. Olive oil, salt and pepper, vinegar, teas and coffee, hot chocolate and marshmallows are provided. This is in addition to complimentary breakfast provisions for the first day of your stay. A full set of matching dishes, cutlery and glasses are provided.A large range of quality kitchen utensils is also provided. Dining can be at the large, fine timber kitchen bench or at the separate round marble table in the window with a view to the garden and forest. A regularly updated range of quality books fills a large bookcase. The books are for your enjoyment and also to purchase if you wish. Books generously provided by Lost and Found Books. Board games, puzzles and jigsaws are provided. A range of drawing materials and a sketch pad is also provided. A range of CD's are provided in the cottage. A large attached deck overlooks the garden with a view to Melbourne. Tables and chairs and electric barbeque are provided. The deck is fully under the cottage roof. Lyrebird Cottages is on 10 acres of beautiful mountain forest with views across the valley to Melbourne. Healesville is 15 minutes from us, the nearest cellar door is 10 minutes away. A day spa in a a beautiful rainforest setting is 5 minutes away. There are over 100 cellar doors in the valley many with restaurants. Healesville Wild Life Sanctuary is 10 minutes from Lyrebird Cottages. Healesville is in a beautiful natural setting only an hour from Melbourne. Surrounded by native forests and only an hour to the nearest cross country ski resort of Lake Mountain. There are wombats and wallabies and many species of native birds in and around the gardens of Lyrebird cottages. Massage in the cottage and wine tours can also be arranged. There is a forest walk through 7 acres of native forest and several walking options nearby including a 2 hour circuit from the cottage through the forest. Meals can also be provided in the cottage or enjoy a sunset whilst dining on the large private deck. Had a sensational weekend here seeing so much wildlife including lyrebirds. Stewart has such wonderful attention to detail, making this a truly special location. Couldn't have asked for anything more, beautiful little house and surroundings such a perfect spot to stay if you are looking for a quiet and relaxing space. Thanks so much for your comments Emily - peace, quiet and relaxation in beautiful surrounds are exactly what we hope we offer. A lovely cottage with every amenity you could afl for. The breakfast pack was also delightful. It was wonderful, even though my partner was a little surprised and frightened when she discovered a moth on her brassiere this morning. Really glad you enjoyed your stay despite the moth! Native animals are all around and are a delight to us and our guests. Even when a wombat climbed the stairs and ambled around the cottage deck at 3.00am waking our guests recently, they felt happy to have such a close encounter with nature and a good story to tell their friends! The wombat scurried away as fast as he could when the guests opened the door. Hope to see you back at Lyrebird Cottages when you are again in the Yarra Valley. Lyrebird cottages are located so close to Melbourne. We loved the birds, the peace and quiet and the spa. Just over an hour from the centre of Melbourne you could be a million miles away surrounded by birdlife, lovely views and the peace of the forest. Glad you were able to come here for your babymoon and recharge before the birth of your child. All the best for 2019. Really glad you enjoyed your stay Al. We have so many guests who tells us how refreshed they feel after enjoying their stay surrounded by nature. Native forest, wombats and wallabies and lots of native birds and just an hour from Melbourne. Vineyards and cafes down in the valley when you want to explore and a very comfortable private house to enjoy when you are here. Lyrebird Cottages is on 10 acres of beautiful mountain forest with views across the valley to Melbourne. Healesville is 15 minutes from us, the nearest cellar door is 10 minutes away. A day spa in a a beautiful rainforest setting is 5 minutes away. There are over 100 cellar doors in the valley many with restaurants. Healesville Sanctuary is Victoria's major native wild life sanctuary 10 minutes from Lyrebird Cottages. Healesville is in a beautiful natural setting only an hour from Melbourne . Surrounded by native forests and only an hour to the nearest cross country ski resort of Lake Mountain. There are wombats and wallabies and many species of native birds in and around the gardens of Lyrebird cottages. Massage can be arranged in the cottage and wine tours from the cottage can also be arranged. There is a forest walk through 7 acres of native forest on the property and several walking options nearby including a 2 hour return circuit from the cottage through the forest. Meals can also be provided in the cottage. Enjoy a sunset on the large private deck with the sounds of birdsong and a view across the forest toward Melbourne in the distance. Large bathroom with double spa bath overlooking garden. There is a separate shower, a handbasin, heat lamps and a heated towel rail. Dining can be at the large fine timber kitchen bench or at the separate round table in the window with a view to the garden and forest. Olive oil, salt and pepper, vinegar, teas and coffee, hot chocolate and marshmallows are provided. This is in addition to complimentary provided for breakfast on the first day of your stay. A regularly updated range of quality books fills a large bookcase. The books are for your enjoyment whilst in the cottage and also for you to purchase if you wish. An electric outdoor barbeque is provided on the attached deck. A large attached deck overlooks the garden with a view to Melbourne. Tables and chairs and electric barbeque are provided. The deck is fully undercover of the cottage roof.